Good afternoon, Squiders! We’ll start our next nonfic topic about coming up with ideas and expanding them into something workable next week. I still need to finish outlining the topic before we get started. But, while we’re talking about that, I’m setting up a new list for authors who’d like to get writing tips and advice in their inbox. You can join here. I’m still tailoring it, so if you’d like to see specific things, let me know! Now, onto theme. You guys know I’ve been working on rewriting the first book of a fantasy trilogy. It was going okay, but about a month ago it fell apart again. Part of that was from getting ready for the conference, but it hasn’t gotten better. Admittedly it’s been harder to get writing time the last few weeks (though that should be done now) but even when I could have been potentially writing, I’ve been avoiding it. It’s been very disheartening. In fact, this morning, I set a deadline for switching to another project if I can’t get my act together. But I still dragged myself to a coffee shop with the intent of getting something done. And I opened my draft. And I re-read what I have of the current chapter. And then I thought I might go back and re-read what I have of the draft (about 48K) to try and help give me some idea where I was going, despite my outline and the fact that I did that last week (and it obviously didn’t help). And then my laptop died (the battery’s shot, so if I accidentally knock the power cord it turns off) so I had a few minutes to stare at thin air while it got its act together, and I decided I should go back and look at my theme for the story. The theme is something along the lines of “Be true to yourself.” Both of the main characters’ internal conflicts stem from this theme, and their gradual acceptance of it is pivotal to the completion of the plot arc over the three books. And just by reminding myself what my theme was, I started to get some ideas about where to go. I think that it’s easy to get lost in the middle of the draft, especially since right now I’m in new territory that hasn’t existed in previous drafts. And sometimes, reminding yourself of the point, of why you’re writing something, can be enough to help you re-center. So hopefully this will be enough to get me back on track. What helps you when your story feels like it’s running into a brick wall, Squiders? I don’t know about your library, but if it’s anything like mine, it has displays throughout of books to entice you to take home more than you can manage. One of these, right in front of the check-out machines, is the “Staff Picks” table, which is evil and alluring and full of interesting things I might not pick up otherwise. I have found many wonderful things on the Staff Picks table. Lovely book, so far, except for one story that was so sexist that I immediately had to go on to the next one to rinse my palate. Some time ago a writer friend of mine made a comment about how you shouldn’t read any books that hadn’t been published in the last five years. I mean, the comment has merit–being up to date with what’s selling can help you target yourself for publication–but I don’t like it. Part of that may be that I dislike the idea of writing to market, as unrealistic as that opinion may be. But the other part of it is that I enjoy older stories and, I would argue, looking at the differences in conventions between different eras has made me a more informed reader and writer. Plus I like Victorian detective stories. You don’t see a lot like them in today’s markets, which seems to trend more toward thrillers or procedurals. What do you think, Squiders? Is it worth it to read any book that sounds interesting, no matter when it was published? Is there some merit to only reading things that are new? I’ve never read it, but I’m pretty sure somebody bought this for me off my Amazon wishlist, so I must have had it recommended to me somewhere, or read something about it and thought it sounded like a good time. Interestingly, it seems like while the trilogy was well-received back in the day, the reviews on Goodreads are all over the place. If nothing else, it should be an interesting look at how storytelling changes through generations, as I’ve previously noted somewhere in the archives that there’s a pretty obvious change in the fantasy genre in the ’80s. I wonder where this trilogy will fall on it? Let’s do one book a month, since that seems to work the best for everyone who wants to read along being able to do so. So let’s read Yearwood by June 15th. And if you have any thoughts on this or potential future readalongs, please let me know, either in the comments or by contacting me directly. Here’s the last PPWC wrap-up post, Squiders, so if you haven’t been digging them, you can rest assured that we will definitely talk about something else next week. Maybe we should a readalong. Haven’t done one of those in a while. I’ll poke around and see what we’ve got. Or we’ll start the next nonfic post series, which will be about finding story ideas. Anyway! Sunday! Last day, which is always a bit sad. It’s really very nice to spend the weekend surrounded by other writers, especially if you are friends with some of them and you don’t get to see them very often otherwise. I was hoping to learn about the “building” part, but the panel was more about the “successful” part. They did talk briefly about how to find people to form a group with, the most promising of which seems to be the idea of joining the local big writing group (Rocky Mountain Fiction Writers) which has a whole section just for forming critique groups. Of course, I’m not sure a critique group is what I’m looking for anyway. This was the least successful session I went to the entire weekend. It was very basic in level, focusing mostly on story structure (which, frankly, I have had better sessions/read better books on). There was also some focus on plotting, such as how quickly your main plot needs to show up, but very little on suspense aside from “if you do a good job with your structure it will show up automatically.” Ms. Bradley did say she normally teaches this information over a six week workshop, but it did not work well in this format. Ah, my second and last marketing panel for the weekend. Ms. Marts went over the options offered in Amazon Central as well as in your books themselves in terms of metadata, author’s notes, reviews, etc. I picked up a couple of new things, which is impressive at this point. She also talked some about how many books you need to be selling to be at which ranks, and touched on ways to get more reviews. Pretty useful, all told. And that’s it for the panels. The conference ends after lunch on Sunday. We did have our final keynote speaker, Donald Maass, who tried to counteract the apparently-common post-conference what-am-I-doing-with-my-life-ness by telling us that as long as we had hope we’d be okay. Donald Maass was also at the conference when I was last there five years ago. My sister and her friend think it’s funny how he picks up a “harem” that follows him around all weekend. So, that’s PPWC for 2017. Will I be going back in 2018? Probably not. There are things I like about it, and I did a good job choosing panels that were helpful and at the right level for me for the most part (something I was bad at in 2012), but it’s a lot of money for a lot of sitting around, and I’d rather be out doing most of the time. It’s a lot to take in all at once. And it turns out that I am bad at one of the most useful things about conferences–the in-person pitch. Hope this was useful, Squiders! I’ll see you Tuesday for something completely different. Hey, squiders! Happy Tuesday! 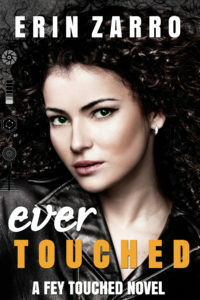 Let’s take a break from PPWC and hear how Erin Zarro wrote her latest book, Ever Touched. I love hearing about how other authors work, and I hope you do too! Writing Ever Touched was interesting because I didn’t use my usual method of pantsing as I did with Fey Touched and most of Grave Touched. Instead, I tried out the “writing from the middle” method by James Scott Bell. In it, you figure out your main “signposts” to write toward: Doorway of No Return, Opening Disturbance, Mirror Moment, Doorway of No Return #2 (Clue/Setback/Discovery), and Transformation. Those seem kind of vague, but really, they are great. You see, I absolutely need some mystery in order to write a book. I’ve been pantsing for years, but that usually led to rewrites after rewrites because I was discovering things as I was going and had to make it all fit together at the end somehow. Grueling work. I’ve also went to the other side of the spectrum, and plotted stuff. And that worked… until I started adding in things because the muse told me to. Sure, overall it made the story richer, but that particular story also ended up in 12 separate pieces. I’m about to embark on a rewrite, and it’s already giving me fits. So this method works better – and produces a cleaner draft – because I have some of it figured out, and I’ve left the rest as a mystery. And I really enjoyed the process, which is super important when you’re writing 120,000 words on a deadline. I also added one additional point of view to the usual 3-POV structure of this series. I felt it was important to have a certain character’s viewpoint because she was completely different, with completely different origins as the others. And I wanted her story, too (I may, at some point, write a novella with her as a main character. She intrigues me that much). So I got to see her grow and evolve throughout the book as well. As for the day-to-day writing, sometimes I didn’t know exactly where to go from where I was. Especially with the climax. I knew there’d be an epic confrontation with the villain and a fight, but the how of it eluded me. It took me several tries to get that right. And I ended up only doing quick written sketches of a few pivotal scenes toward the end because I literally ran out of time. One part was added in final edits because of something my editor said that I agreed with. That was probably the hardest – I wouldn’t have another shot at it before release, so I had to use my judgment as to whether or not it worked. I think it did, and I hope it does for the readers, too. And then there was the theme song, which refused to show itself until 107,000 words in – that was interesting. It is “The Sound of Silence” as covered by the band Disturbed. It was playing during a very emotional scene between my two main characters and everything kind of clicked. Now, every time I hear that song, I will always think of that scene and those characters. And finally, Brianna and Cobra’s romance. I knew sometime around Grave Touched that I wanted to put these two enigmatic characters together. They both had very big secrets, and lots to lose. And as I started writing them…they made sense. Every scene built on this beautiful, epic love story I was creating. It worked perfectly. I never had a single doubt about these two. They fit. And they loved each other deeply, and truly, and it was breathtaking to watch unfold. But it’s tragic, too, due to some things I can’t reveal. Don’t worry, it ends happily. But they have to work hard for it (hell, all my characters have to work for their Happily Ever Afters. I’m a cruel mistress). I also enjoyed creating the Ascended (no spoilers!) and exploring some of the aspects of who and what they were. That came to me literally in a flash as I was closing up at work. I’m glad I paid attention. It took a bit of writing to figure them out, but once I did…they were awesome. And they came from my brain! All in all, I am very happy with how Ever Touched came out. It challenged me at times, made me cry at others, and excited me. I really loved writing using the writing from the middle method. My next novel will definitely be written this way, too. Sometimes you have to break out of the routine, and do something completely different. With Ever Touched, I did that and more. So I hope you enjoy Ever Touched, Brianna and Cobra, and the Ascended. There are others, but that would be a spoiler. I really loved writing it and think it fits very well within the Fey Touched world. I always wonder if you can piecemeal PPWC. There’s always notes about what to do if you’re missing a meal (and if you’re at the conference for the whole weekend, why would you? It’s included in the price and the food is really good) which always makes me think maybe you could just come for, say, Saturday, but I don’t know if that’s an actual thing. Let’s dive into the sessions from Saturday. Like Friday morning, Saturday morning ended up a bit themed, and in this case it was time/project management. This isn’t really an area where I am deficient, but it is a subject I like to talk about and see how other people do things. In this case, Becky spends a week making a massive outline/synopsis (which she sends out to betas to get feedback on plot and whatnot because it’s that complete) and then spends the next several weeks writing and editing. Some neat organizational ideas which I will probably try out. Ironically, the example he used was also an eight-week novel, which I found hilarious but probably no one else did, because normal people probably didn’t go to two time/project management sessions in a row. This method made my engineering side very happy, but from a basic standpoint was also very similar to other writing management processes I’ve seen before. I enjoyed it. I do need to get in touch with the presenter and ask some questions (mostly about throwaway things on the slides which caught my interest, or something he said, and not about the actual subject matter of the presentation). M.H. Boroson wrote the bestselling historical fantasy novel The Girl with Ghost Eyes, which I have not had the opportunity to read but understand is awesome. This panel was also pretty awesome. We talked about the basics of action scenes (which are not just fights), broke them down into their components, and went through examples so we could see the basics put together. My other favorite panel aside from Stant’s on Friday. And then we had lunch, which was a massive roast beef sandwich. With a pickle. Kevin Hearne (Iron Druid series) was the keynote speaker. Sometime between the last time I went to PPWC (2012) and now, they’ve switched from your straight pitch session (where you would memorize a verbal pitch and get to pitch an agent/editor) to the query 1-on-1 format. You bring your query letter, agent/editor reads it and gives you feedback, and may ask for more materials if they’re interested. I met with Mike Braff, who is an acquisitions editor at Del Rey (at the very odd time of 2:24 PM). He asked some questions about the main character and said I should focus more on her character arc and the twist of the story in the query. He also said it wasn’t really his thing, alas, though I kind of suspected that there wouldn’t be enough explosions based on some of his recently edited books (The Red Rising trilogy by Pierce Brown, Sleeping Giants by Slyvain Neuvel) and my sister went to an editor panel earlier and later told me he’s pretty much only looking at scifi right now. So, in retrospect, I probably should have signed up for someone else. I’ve found that the panel sessions can sometimes be less helpful than the one or two presenter ones, and I think it’s because they’re not really planned out in advance. I mean, I assume, but I don’t know, but from what I understand the moderator has normally come up with questions in advance and then the panel answers them. I mostly learned about various authors’ planning processes, which is interesting, but not necessarily helpful. This was a good panel! Chris and Todd focused a little bit on what your story needs at the beginning and how long you have to hook a reader/agent/editor, but we spent most of the time going over the beginnings of published books and looking at what worked and what didn’t, and also did an example where we took a bad beginning and made it better. Dessert was not as good as Friday night, alas. My sister and I hit BarCon now that we’d done our Read & Critiques and Query 1-on-1s and no longer had anything to stress out about, but it turns out that we are actually terrible at networking aside from people we already know. And then I had a crisis of purpose (which, from talking to people since PPWC ended, seems to be common at writers’ conferences) and had to go to bed. Sunday sometime next week! Also, I will have a guest post for you, probably on Tuesday. It is about ten degrees warmer than it is supposed to be, Squiders, and I think I shall go take a walk.